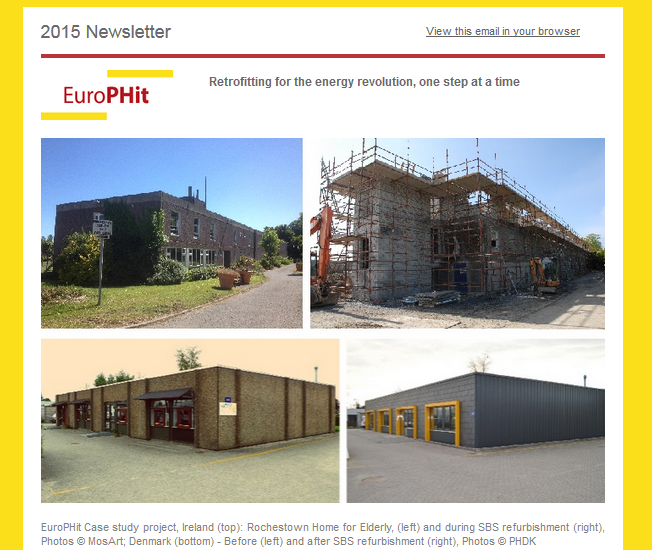 With the EnerPHit Standard as the goal and Passive House principles as the basis, EuroPHit applied knowledge on deep energy retrofits to the oft-overlooked yet critical area of step-by-step refurbishments. Updated Passive House building certification criteria newly released! 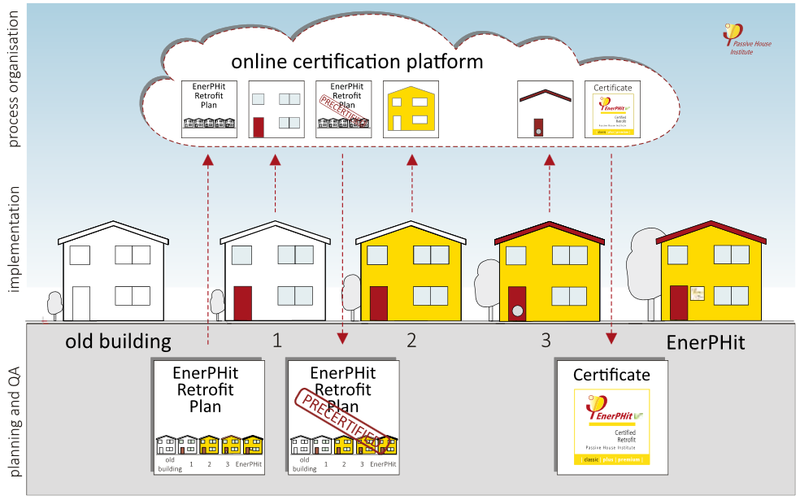 The new update now includes criteria for pre-certification for step-by-step retrofits, as developed through the EuroPHit project! Calculating and planning deep energy retrofits is now made easy with the latest updates to the Passive House Planning Package, which now includes the EnerPHit Retrofit Plan (ERP). One output of the EuroPHit project was the creation of an accessible informational brochure that highlights the successes of the EuroPHit project and case studies. The brochure draws on the lessons of demonstration projects implementing deep energy step-by-step retrofits in 11 EU Member States and aims to raise awareness and promote deep energy retrofits on the existing building stock. 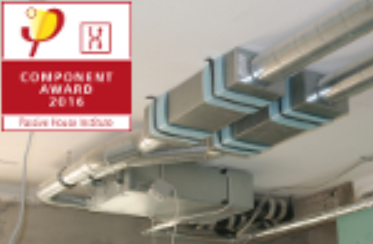 The winners of the Component Award 2016 for ventilation solutions in residential buildings were presented with their awards at the 20th International Passive House Conference in Darmstadt on 22 and 23 April 2016. The first prize went to a concept by the Austrian manufacturer Pichler. A joint second prize was granted to the Dutch company Vaventis and the Italian firm Michael Tribus Architecture. To find out more and read the new Component Award brochure click here. 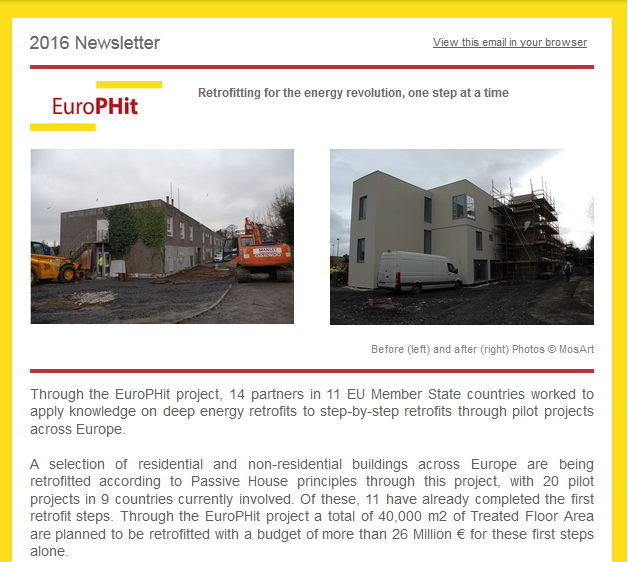 Within the EuroPHit project, a selection of residential and non-residential buildings across Europe were retrofitted according to Passive House principles. There were a total of 20 pilot projects in 9 countries actively involved in the EuroPHit project. Of these, 11 have already completed the first retrofit steps. 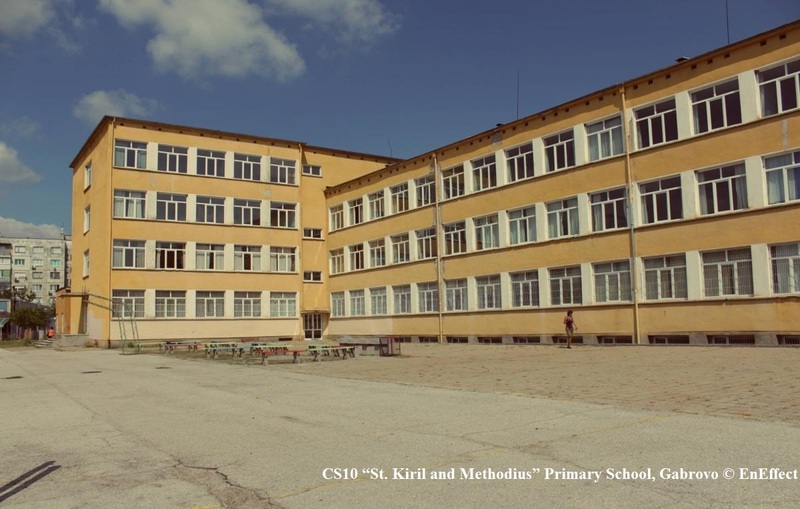 Through the EuroPHit project a total of 40,000 m2 of Treated Floor Area was planned to be retrofitted with a budget of more than €26million . Low-cost, comfortable, sustainable – that's the future-proof formula for the buildings of tomorrow. During the International Passive House Days from 13 to 15 November, everyone will be able to see how this concept is already working. Hundreds of built examples will be open for viewing. Experts will demonstrate how these buildings function, residents will talk about their experiences. An overview of the Passive Houses participating in individual cities and regions around the world can be found on: www.passivehouse-database.org. 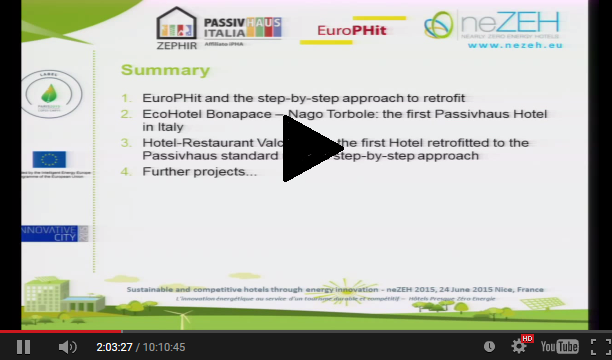 24 June 2015 in Nice, France as part of the conference Nearly zero energy hotels our partners Francessco Nessi (ZEPHIR, at 2h 01') and Simon Camal (LaMP, at 4h 36') presented their experiences on their case studies and EuroPHit project. Leipzig. Energy efficient construction has never been so easy – and this is due to the increasing availability of suitable components. 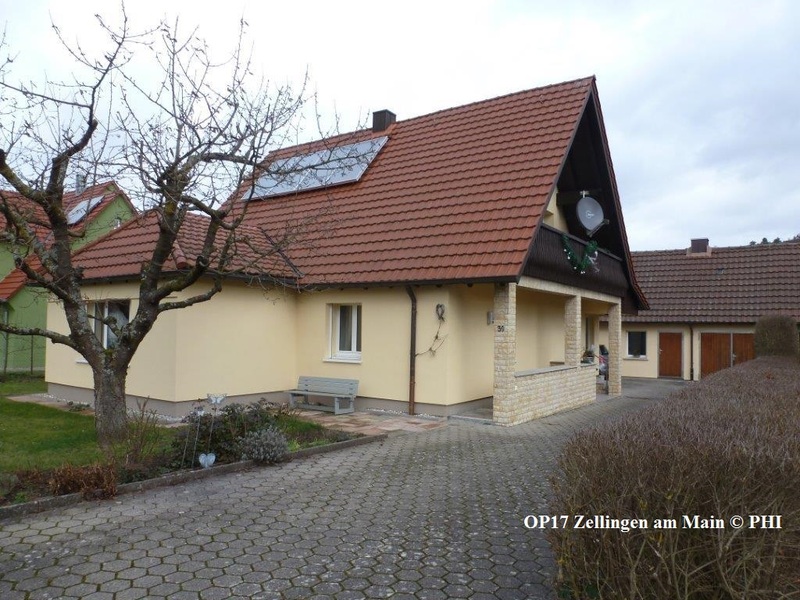 The key focus at the International Passive House Conference 2015 in Leipzig was on the latest developments in this area. Experts from around the world presented the enormous savings potential of certified windows, insulation systems and ventilation systems, and demonstrated their practical implementation. The lectures on 17 and 18 April clarified the importance of well-conceived and consistent action in the building sector for a successful transition to a sustainable energy future. The Passive House Standard enables every building owner to benefit from the energy revolution, with certified components ensuring cost-effectiveness. This basic concept was the focus of the International Passive House Conference, held from 17 to 18 April 2015 in Leipzig. Speakers from all over the world presented exemplary projects and solutions for building systems, ventilation units and windows. An exhibition provided specific examples of products currently available on the market. The main challenge in the Component Award 2015 for Passive House windows was that the product had to show a degree of flexibility since refurbishments are often carried out in a step-by-step manner. Ideal windows had to deliver excellent results during the transitional period as well as after the completion of all refurbishment measures. The cost effectiveness of the windows was assessed first and foremost, with a comparison of purchase costs with potential savings. However, the jury also considered practicability, innovation and aesthetics. 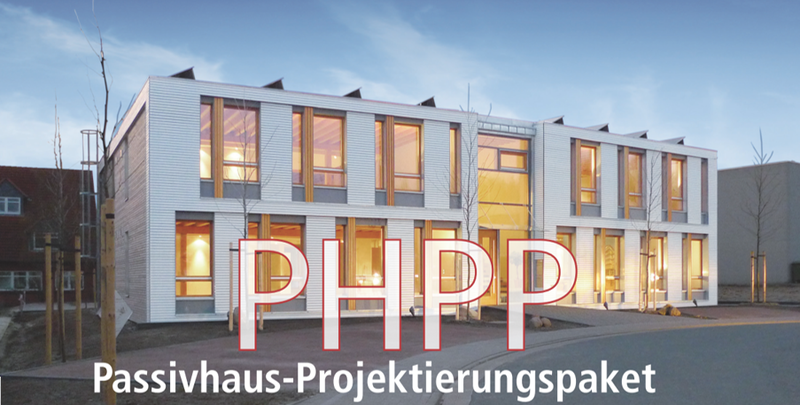 The award will be presented on 17 April at the International Passive House Conference 2015 in Leipzig. Have a question on step-by-step retrofits and financing? EuroPHit and its project partners will have their own booth at the 19th International Passive House Conference as part of the Passive House Institute's exhibition. Come check us out at booth No. 3.7 in the exhibition hall at the Congress Center Leipzig. EuroPHit Partners will be on hand to answer all your questions! 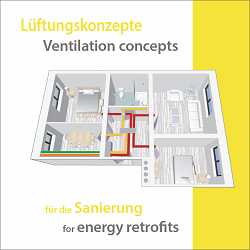 As part of the exhibition, energy efficient components suitable for step by step retrofits will also be on display. The component award will also be presented next to the EuroPHit booth and many Certified Passive House windows will be on display here. Or come and learn more about step by step reftrofits at the 19th Passive House Conference Sessions and its Framework Programme. Participate now for a chance to win PHPP9 and designPH bundle or free iPHA Membership! The concept of step-by-step retrofits varies greatly across borders and achieving incremental energy efficiency gains is increasingly an interesting discussion to be had at the international level. 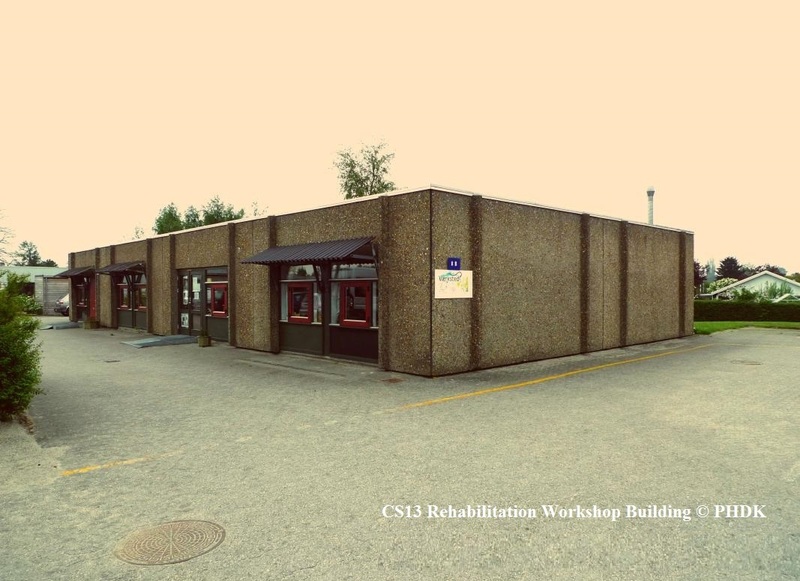 EuroPHit now has a dedicated place on the iPHA Forum where weekly discussions on step by step retrofits will be held. Experienced researchers of the Passive House Institute and EuroPHit partners are ready to answer your questions and share their experiences, including EuroPHit case studies. Topics range from certification, technical and conceptual details, project financing, product ideas and will also include weekly opinion polls. All Forum participants with a minimum of 15 posts will be entered into a random draw for a chance to win one of 3 free bundle packs of PHPP9 and designPH or 3 six-month iPHA Memberships. 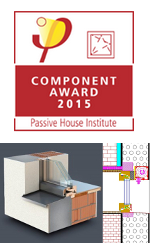 Winners will be announced at the 19th International Passive House Conference. Still don't have access to the iPHA Forum? Sign up with the EuroPHit network, free of charge, and benefit from access to technical experts and experienced practitioners, and be kept up to date on project progress and key project outcomes. Press Release: 19 December 2014, Darmstadt, Germany. Press Release: 20 November 2014, Darmstadt, Germany. A concept developed by the Passive House Institute for the energy-focused modernisation of buildings has won first prize in a competition. The award jury especially lauded the approach of a "refurbishment road map" with appropriate individual steps. The concept was largely developed within the framework of the EU funded EuroPHit project. The intent is to provide both a certification of such "overall road maps" as well as an energy assessment of the individual refurbishment steps in the planning tool PHPP. The award was initiated by the Institute for Energy and Environmental Research in Heidelberg (ifeu). Press Release: 12 November 2014, Darmstadt, Germany. Press Release: 25 September 2014, Darmstadt, Germany/Verona, Italy. Press Release: 16 September 2014, Darmstadt, Germany. Press Release: 2 September 2014, Darmstadt, Germany. 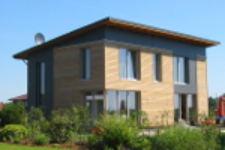 A Passive House building does not just save costs; one of the main advantages of this energy-efficient construction method is the high level of thermal comfort it offers. 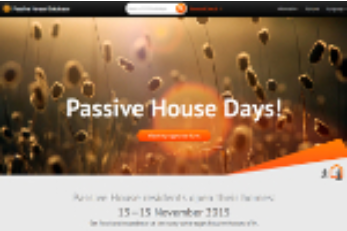 Those wishing to get their own impression will have the chance to do so during the Passive House Days event which is taking place from 7 to 9 November in many countries. Experts will demonstrate how it works, residents will share their experiences. An overview of the buildings being opened to the public in various cities and regions is provided on www.passivehouse-database.org. Press Release: 25 August 2014, Hamburg, Germany. 17 June 2014. Energy efficiency is getting some much deserved attention in the EU of late as ministers from seven member states issued a letter urging the EU Commission to take a harder stance by laying out binding targets for 2030. With the current crisis in Ukraine as their starting point, the ministers affirm that the “reduction of energy consumption through energy efficiency is the most robust and cost effective means of increasing energy security and reducing emissions of greenhouse gases.” This letter comes in the run up to a review of the EU’s progress toward set energy efficiency targets for 2020 (see eceee.org review). In January, the Commission had suggested an obligatory 2030 target aiming for a 40% reduction in greenhouse gas emissions, but had left energy efficiency out of the talks in anticipation of this summer’s review. The review has been called for as a result of the EU’s lack of headway towards the original and non-binding target of a 20% improvement in energy efficiency. According to the Euractiv website, a pre-review report sees vast benefits for the EU’s economy if a binding target of 40% were to be agreed. 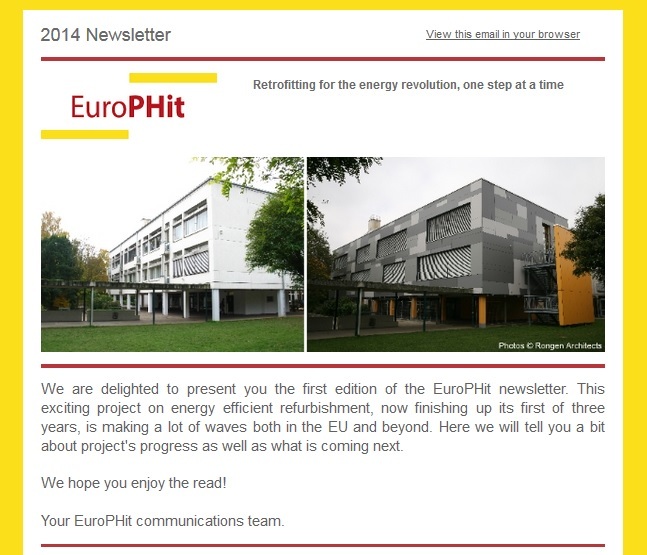 EuroPHit Newsletter 2014 is now out! 30 May 2014. Summary of what happened last year in the EuroPHit project is now available! Read it here. Darmstadt, Germany. 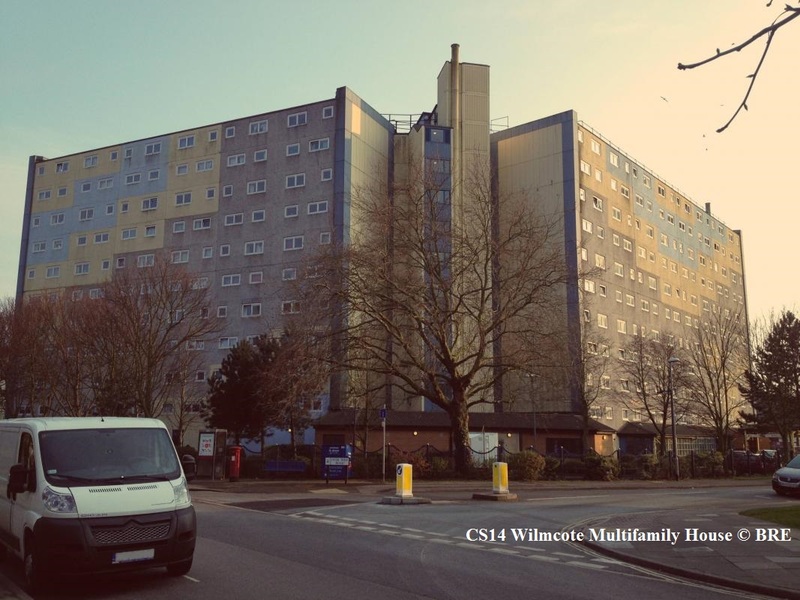 Hospitals are among the most energy-intensive of building types. Here too, the Passive House Standard provides a solution that results in considerable savings. The time is ripe to take advantage of this finding. In Germany, for example, many of the some 2000 hospitals are currently in need of refurbishment – likely a familiar situation in numerous countries. In the Hoechst district of Frankfurt an older hospital building is currently being replaced by a new build with a focus on maximum energy efficiency. 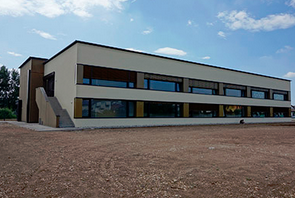 The result will be the world's first Passive House hospital. Critical issues regarding the execution of this project were elaborated in a baseline study commissioned by the State of Hesse (in German). There is a huge potential for saving energy in the building sector; how this works in practice was demonstrated at the International Passive House Conference in Aachen, Germany. On 25 and 26 April, experts from all over the world presented latest projects and practical solutions. An accompanying components fair provided with an overview of opportunities for practical implementation. 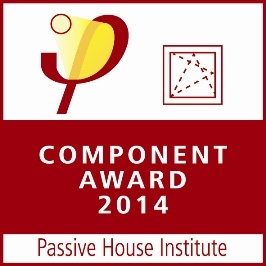 The winners of the first ever Passive House Component Award have been selected - a total of twelve Passive House windows will receive recognition. The real winners, however, are the building owners, for the results of this international competition show that it is possible to save money with highly efficient building components. Darmstadt/Aachen, Germany. When it comes to energy use, it is most sustainable to focus on efficiency first. With Passive House, this is also cost-effective. Practical examples of this approach will be presented by experts from around the globe during the 2014 International Passive House Conference and framework programme, to be held from 23 - 27 April in Aachen, Germany. New projects and the latest solutions in the area of energy efficient construction will be showcased by speakers in more than a hundred lectures. An accompanying trade fair will offer an overview of the breadth of possibilities available. Before the PHAI conference and in parallel to it, the fourteen EuroPHit project partners from across Europe took part in training sessions and carried out project meetings to discuss the project progress and dissemination. Read more about Now up! Final Financial workshop was held to explore the deep retrofit financing. Cost: FREE, spaces are limited.